Why does your company exist? What is the problem you are trying to solve? Where are you going in the future? In order to keep your growing team on the same page you should define (and put up on visible flat screen monitors if you can) your purpose, mission, and vision. What’s the difference between a purpose, mission, and vision. Mission is the WHAT, the vision is the FUTURE, and purpose is the WHY. iContact’s Mission: Making online marketing easy so companies and causes can grow and succeed. iContact’s Vision: Build a great global company, based in North Carolina, for our customers, employees, and community. Purpose – Your company’s purpose is the WHY behind what you do what you do. iContact’s Purpose: Create value for our customers, employees, community, and shareholders while having fun and serving as a model for what a high-growth venture-backed company can become in terms of social and environmental responsibility. I went to Opportunity Collaboration skeptical. Why was a conference on poverty alleviation being held at a beach resort in Mexico? I left Opportunity Collaboration on Tuesday morning in awe of what the conference had accomplished. It was a rare masterpiece of an ‘unconference’, organized by Jonathan Lewis of MicroCredit Enterprises, and put on by COO Topher Wilkins with the help of quite a strong team of volunteers. While I would rather have been less separated from the local communities of Ixtapa and Zihuatanejo, Mexico, I must admit the setting did serve the purpose of allowing the 300 attendees to connect deeply in a relaxed environment. The attendees, called “delegates”, were a mix of entrepreneurs, social entrepreneurs, investors, foundation directors, and non-profit directors. The conference also welcomed 50 Cordes Fellows which greatly added to the age and geographic diversity of the crowd. The conference ran from Friday night through Tuesday night. I left Tuesday morning to get back to iContact as we have a very big week getting ready to move 235 team members this Friday to our new offices in Morrisville. There were no panels and no keynotes. This led to people having the time to connect in deep conversations. It was one of the more enjoyable long weekends I can remember in my 26 years of life. Having the opportunity to engage deeply with some of the most innovative practitioners in the field of poverty alleviation and social entrepreneurship was immensely inspiring and beneficial. Being laser-focused on getting iContact to an IPO in the next couple years and now having a great staff who can attend our 25 or so company trade shows each year, I’ve scaled back the number of conferences I attend in the past couple years. I tend to limit it to Summit Series, the Skoll World Forum, Renaissance Weekend, and a couple investment bank or analyst conferences per year. I will now add Opportunity Collaboration to the select annual list. Why Did I Choose to Come? OppColl was talked about heavily when I was at the Skoll World Forum in Oxford in April and came recommended to me by people whose opinion I trust–Nathaniel Whittemore of AssetMap, Kim Scheinberg of Presumed Abundance, Jonny Dorsey of Global Health Corps, Mike Del Ponte of SparkSeed and Ben Abram of Westly Group. And so I signed up, not really knowing what would come of it. My interest in being at OppColl was four-fold. Vacation & Strategic Reflection: After working non-stop since February on our $40M Series B fundraise at iContact it was good to take three days off for a mini-vacation. Any time I can get out of my normal environment I find I can think more clearly about our strategy and get a big picture perspective. It turned out to be quite a valuable experience just from an iContact perspective, as there were a number of deep discussions on leadership I gained from and I wonderfully ran into at least ten of our customers who I always love connecting with about what they think about our company and product and what their additional needs are. A Passion for Ending Extreme Poverty: A large part of my interest in attending goes back to a lifelong passion I have of wanting to be part of a generational movement to end extreme poverty in our lifetimes and learn all I can about the topic. In a world with so much, it just does not make sense that 2.5 billion people live on under $2 per day and 22,000 children five or younger die every day in the developing world—most needlessly from preventable disease and starvation. I think I can make the biggest difference in extreme poverty in the mid-term via investing and private-sector job creation, but I’m very aware that it requires all three sectors (government, business, and civil sector) to work together. To actually create sustainable economic development the trifecta of transparent, non-corrupt, responsible, and well-run government, civil sector (NGOs/NPOs), and businesses must exist. OppColl does a great job of bringing together folks from all three sectors to collaborate. Nourish International: The non-profit organization for which I serve as Board Chairman, Nourish International, is at an important point in its history. It is transitioning from a completely donor-reliant model to a more sustainable model that includes a portion of its revenue from earned income. I came to connect to other non-profit directors and board members that have successfully created substantial earned income models for their organizations. Humanity Fund: I launched a small personal investment fund called the Humanity Fund in January. Going to OppColl was perhaps the easiest way to connect directly with the leaders of the microequity field. Through the Humanity Fund we invest $10k to $100k at a time in socially responsible high-growth for-profit businesses in Africa, Latin America, and the USA. This is a small effort for now in which I want to dip my toes into the water and make a couple investments per year as a way of gaining some learning lessons, getting exposure to high-growth businesses in “frontier markets” and investing in creating jobs in high-growth socially responsible businesses that are growing quickly. My hope over time is to show that it is very possible with the right structure, even with the challenges of transaction costs, trust, and liquidity, to achieve above-market returns by investing in microequity and investing in the missing-middle of SME financing in which growth capital simply is not presently available. I already have a sense a number of these will turn into lifelong friendships. The morning “Colloquium for the Common Good” offered an opportunity to connect deeply with a group 25-30 randomly selected delegates through two hours of discussion on a set of readings related to poverty alleviation (though I must admit I still struggle to understand why we were asked to read Antigone for day two). Our colloquium group was moderated by the well-known photographer Paola Gianturco. On the Saturday night a group of the millennial generation social entrepreneurs decided to have an ad hoc “indigenous community cultural immersion exercise” and went dancing in Ixtapa for a few hours so I regrettably missed out on the Sunday morning discussion of Antigone. A Letter from Birmingham Jail by Martin Luther King, Jr.
We used the 11am hour two of the days to convene a group of younger entrepreneurs and social entrepreneurs to mind-map out on a whiteboard what we are currently doing to be part of ending extreme poverty. Then we shared our plans for scaling our impact over the next four decades and being part of the global movement to actually end extreme poverty by 2050. This was perhaps the hour of discussion I most looked forward to each day. Being able to map out the role I hope to play and gain feedback and go deep with Saul Garlick of ThinkImpact, Jonny Dorsey of Global Health Corps, Mark Hanis of the Genocide Intervention Network, Ben Abrams of Westly Group, Asher Hasan of Naya Jeevan, Leticia Casanueva of CREA, Amity Weiss of Rwanda Nziza, Mohamed Ali Niang of Malo Traders, and Elizabeth Dearborn Davis of Akilah Institute was intriguing and energizing. After lunch we had time to relax or exercise. Having 90 minutes built in each day for “wellness” was unique and much appreciated for a conference. I kayaked, played soccer, swam, and even trapezed during this time. The 3pm sessions convened groups of 30-40 in a chair-circle format to discuss a particular topic. My favorite “Collaboration Challenge” was the Millennial Social Entrepreneur themed session on Monday, particularly when we split off into a group to discuss for-profit social entrepreneurship and how to use the great power of markets and investment capital to increase social impact. Some folks in the room thought that by definition you couldn’t be a social entrepreneur if you ran a for-profit business. No consensus from the group emerged, but I along with others made every effort to make the point that the entrepreneur who runs a socially responsible enterprise, regardless of entity structure, is a social entrepreneur. Personally, I define a social entrepreneur as a “problem solver who takes action.” To me, there are for-profit social entrepreneurs and non-profit social entrepreneurs and in some cases you can actually make a larger social impact by choosing to organize as a for-profit and be able to access capital and talent markets more effectively. Finally, each night after dinner was capped off by “Companies and Causes” a 60-second pitch session run by R. Paul Herman, author of HIP Investor. Perhaps 40 of the attendees pitched each night. These pitches were generally good, with the sole exception of the unfortunate rule that if you combined into a larger group you would get as much as 3 minutes each instead of 1 minute. This caused the room to lose energy and the hour long pitch session to go 90-100 minutes, beyond the interest of most attendees who ended up hanging out instead in the adjacent bar. Overall, “Companies and Causes” was a great new addition to the conference, however I’d recommend keeping every pitch to 60-75 seconds next year. Less truly can be more. Each night seemed to end with a spontaneous group of 20 and 30-somethings swimming in the Pacific. So Should You Go to OppColl Next Year? And so, if you’re working in the field of social entrepreneurship broadly defined, are interested in meeting the CEOs of entrepreneurial ventures that have a huge potential for both financial and social return, care deeply about humanity, or care deeply about actually ending extreme poverty in our lifetimes, Opportunity Collaboration is probably the best conference to come to for the deep relationships it affords. It is not the best conference for content or big-name speakers–the Skoll World Forum on Social Entrepreneurship is much better for that–but it is the best conference I’ve been to for facilitating the creation of deep, meaningful, beneficial relationships that can help both parties make an increased positive impact in the world. The conference is not inexpensive, so if funding is an issue be sure to apply early for a 2011 Cordes Fellowship. Hope to see you there in 2011! Were you there? What were your experiences? Do you wish you were? Is it justifiable to have an expensive conference on poverty alleviation at a resort if it brings great people together who in fact due to the connections they make are able to more effectively scale their social impact and more quickly end extreme poverty? We’d love your comments. There is a perception out there that there is a tradeoff between social responsibility and financial responsibility. You can’t do both, people say. You can’t have your cake and eat it too. Well, very fortunately the data just doesn’t support that perception. Can you actually be more socially responsible and increase shareholder value at the same time? 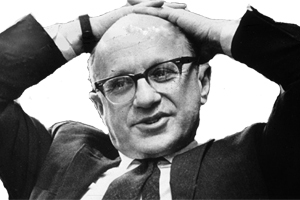 In 1970, Chicago-school economist Milton Friedman proclaimed in an article for New York Times Magazine that a company’s only social responsibility is to increase profits for its shareholders. In the 1980s Ronald Reagan, Margaret Thatcher, George Bush, and the Ayn Rand star-pupil Alan Greenspan turned this credo into de facto policy gospel. There is passionate and meaty debate whether externalizing environmental damage and exploiting a work force is okay if there is no law or regulation against it. There is another debate whether these practices actually maximize long-term profits or the present value of future cash flows. For a moment, let’s take this 1970 proclamation at face value and assume that an executive’s responsibility is to increase returns for company shareholders. Let’s agree that executives and board members do have a fiduciary responsibility to seek to gain a return on the capital invested in their organization, particularly if they work for a publicly-owned company or a company that is not a wholly-owned private corporation. So this begs the question, can you do both–increase social return and increase financial return? Can You Be More Socially Responsible & Financially Responsible? Raj Sisodia, David Wolfe, and Jag Sheth recently published “Firms of Endearment: How World-Class Companies Profit from Passion and Purpose.” In the book, they share the results of a study in which they looked at companies that were especially socially responsible–they call these firms “Firms of Endearment” or FoEs. They compared the shareholder returns of these socially responsible firms with the S&P 500. What they found was that the firms that were socially responsible outperformed the S&P 500 by 9x. These Firms of Endearment grew shareholder value 1025% in the last ten years while the S&P 500 returned 122%. Even when you compare the Firms of Endearment vs. the blue chip success stories profiled in Jim Collins’ Good to Great, the Firms of Endearment win. The firms profiled in Good to Great returned 316% while the FoE’s returned 1025%.” Here’s the graph from their web site. Now, by no means does this data prove conclusively that more socially responsible firms create higher shareholder returns. The data show only correlation, not causation. The reality could simply be that firms that happen to be socially responsible happen to be in more profitable industries and so they can afford to give more to the community and create better work environments. But nonetheless, the point is clear– investing in being a socially responsible company certainly does not by definition go against shareholder interests and in many cases enhances shareholder returns. Vendor cost reductions of $40,000 driving estimated net savings of $19,000 per month. Increased employee engagement and excitement to be working at our company (which we believe will lead to greater passion in people’s work, additional discretionary effort from team members, increased productivity, lower regret employee turnover, and an increased ability to attract the best and the brightest). Additional press coverage from Entrepreneur, INC, and the Raleigh News & Observer that is helping us recruit the best and brightest and gain additional customers and partners. So in fact, at least so far, we have been able to show both tangible and intangible benefits that connect the investment we are making in social responsibility with direct economic net benefits to our financial results and thus to the increase of shareholder value. While it would be nice to have even better data and employee surveys comparing before and after our work at iContact, there is substantial anecdotal evidence supporting a conclusion that in the case of iContact, increasing investment in social and environmental responsibility so far has increased profits, and will contribute very positively to increasing shareholder value in the many years to come. So does increasing social and environmental responsibility always increase shareholder value? No, it does not. But in many cases it can and does and the Firms of Endearment study provides a fascinating basis for a likely connection between the most socially responsible firms and those who produce the highest return for shareholders. Investing in being a socially responsible company certainly does not by definition go against shareholder interests and in many cases enhances shareholder returns. There does seem to be substantive and significant evidence showing there the tradeoff between social responsibility and financial responsibility is false and in fact social responsibility in many cases aligns with increasing financial profitability. Thanks for reading. I’d love to know your thoughts in the comments on social responsibility, effective CSR programs, whether being more socially responsible helps or hurts a business, and whether your shopping decisions could be influenced by whether a company is responsible or not. Here is a case study sharing the initial results of of iContact’s efforts around social responsibility. The post was first published earlier today on Change.org. In October 2009, I went through some challenging experiences that caused me to realize that life can be very short. Out of these experiences, I came to the conclusion that I wanted to align my values with my work at iContact to the extent possible. I wanted to see a direct connection between the work that iContact was doing and making a positive impact in our community and the world. As Chip Conley writes in Peak, I wanted to be able to experience and see “meaning” at work and in my work. The humanity within me was dissatisfied with the comm only-held belief that the sole purpose of business is to maximize short-term profits, regardless of the impact on the world as long as one stays within the law. I saw the purpose of business as creating value for humanity and profits a result of successfully pursuing this purpose but not the purpose itself. This extreme dissatisfaction with the Milton Friedmanesque view of the world could be a Gen-Y or Millennial phenomenon as our generation has grown up learning we cannot build a prosperous, stable, and secure world by externalizing environmental costs and exploiting other parts of the world. While our generation may be particularly attuned to social and environmental issues, I think seeking meaning at work is a higher-order, but universal need. It is simply reality for the large majority of workers (particularly the smartest and most driven talent) that they want to be able to be part of something meaningful–in their contribution to the company, in what the company achieves with its business, as well as the ways in which their business goes about creating that value for society. Helping small and mid-sized companies communicate more easily with their customers and reducing paper usage from direct mail had a positive value to society, but could we create meaning in other ways, perhaps in how we went about building our business, the culture we created, and how we gave back? I could no longer compartmentalize my life between the for-profit financially-focused work I did and the not-for-profit charity-focused work I did. And so, going into 2010 I made it one of my priorities to substantially expand our Corporate Social Responsibility (CSR) efforts at iContact. These initial efforts were a start, but not enough. If we were going to make CSR a key differentiator for our company for attracting and retaining A+ talent and attracting customers who care about the world, we needed to do so much more. If our culture was going to be centered around creating a tangible direct connection between the work our employees did and true-meaning and value creation for the world, we needed an integrated CSR program. And so, taking a page from the playbook of Marc Benioff, we created the 4-1s CSR Program, modeled in part after the 1/1/1 Integrated CSR Program that Salesforce.com has so successfully implemented after Marc’s experiences at Oracle in the late 90s left something to be desired for corporate service. The 4-1s CSR Program added giving 1% of product, 1% of time, and 1% of equity to our original program of giving 1% of payroll. On January 8th, 2010 we rolled out the 4-1s program to our employees at our annual kickoff meeting. We explained that each team member would receive 2.5 extra days of Paid Time Off per year to volunteer in the local community which we would track via an AppExchange add-on called VolunteerForce, that we were taking 1% of the shares of the company and pledging them to the iContact Foundation, that we would give iContact away from free to any non-profit in North Carolina, and that we would continue our program of giving 1% of payroll away and matching employee contributions up to $300. I was thrilled to have a formal CSR program in place. When Entrepreneur Magazine wrote an article about the 4-1s program in April giving us our first major press about the effort, I was careful to share that this was just the beginning for us. We have so much to learn about CSR. Who knew if this was the right or best structure for integrate corporate philanthropy. What mattered is that we had something formal and significant in place and could learn and improve as we went. In May, we took our next major leap in our effort to turn iContact into a leader in social responsibility for venture-backed companies. After speaking with Drew Tulchin at Social Enterprise Associates, I knew if we really were going to be a Triple Bottom Line company, we had to have some type of external help putting in place a tracking system for our social and environmental impact. The next weekend I serendipitously met Matt Kopac at at Sunday brunch with a group of Durham friends. Matt had just finished up an MBA at Yale and was looking for work in the area with a non-profit or socially responsible enterprise. He had done work with VisionSpring and had been in the Peace Corps in Benin. We brought Matt on, initially as a half-time consultant. Matt’s assignment was simple–put in place a measurement system for social and environmental impact, manage our 4-1s CSR program, and help us put in place the changes necessary to become a B Corp. B Corps are are a new type of corporation that use the power of business to create public benefit. When we first took the B Corp assessment, we scored 67 points. The assessment graded us within five categories: accountability, consumers, environment, employees, and community. We then underwent an eight week process that Matt led to conduct an environmental/energy audit and supplier audit and put in place some needed changes to policies and sustainable supplies. On June 30th, we finally passed the 80 point threshold needed. B Lab officially certified iContact as a B Corp! We had reached the next milestone for our process of becoming a leader in social responsibility and creating company culture that tied the work each employee did every day with meaningful impact, and we received a signed Declaration of Interdependence. Once we became a B Corp, we needed a way to be able to track our social and environmental impact. Matt Kopac worked with our internal Salesforce.com administrator to install PULSE into Salesforce AppExchange, which is free for B Corps. Below is a screen shot of PULSE showing a few of the environmental metrics tracked within PULSE for iContact. In Salesforce PULSE we track the following social and environmental metrics in beautiful graph format in a location that is accessible to every iContact Employee. You can imagine how much easier this system makes it to track and view our triple bottom line metrics. To further our connection to employee-driven change we created an employee-led group called Changemakers. We now have a Social Changemakers Committee and an Environmental Changemakers Committee that meet monthly and come together once per quarter to make their recommendations to the company. While putting in place the structure initially needed coordination and buy-in at the highest levels of the organization, to expand our efforts and integrate the values and ethos of our company permanently into our culture we need the energy, support, and word of mouth of individuals at every level of the organization. Back in November 2009 I was speaking to an iContact employee who told me, “If you can connect the work I do at iContact to making an impact in the world I would be so much more passionate about coming to work everyday.” This was a key moment for me in making the immediate connection between ‘meaning’ at work and the incremental discretionary effort employees are willing to put into their jobs. As Chip Conley wrote in Peak, If you can tie in “meaning” into the workplace you will get orders of magnitude more productivity our of your team. Too often companies are meaningful lifeless entities that are focused on short-term profit maximization rather than maximizing sustainable value creation for human beings, what actually maximizes long-term profits. Personal Meaning – how the job ties into to the individual’s life goals. Work Meaning – the significance of what the individual is enabling the company to achieve and the understood connection between their work and company success. Organizational Meaning – the significance of what the organization succeeding means for human society. So in the “Employee Hierarchy of Needs” money is at the bottom which creates base motivation, recognition is in the middle which creates loyalty, and meaning is at the top which creates inspiration. So, has the social responsibility initiatives we’ve undertaken so far created added meaning for our team members, and can it for yours? But the impact is not only in increasing employee engagement, but also increasing customers and partners that expressly seek out wanting to work with socially responsible companies. One of the ways this has been possible is because B Labs has a network of over 300 B Corps and companies that want to access the economic buying power of B Corporations. Once our current contracts expire and we’re able to move to the discounted solutions, we expect to realize about $40,000 per month in savings from being a B Corporation while we are spending a total of $21,000 per month of all of 4-1s Program. Significant credit goes to Salesforce.com for offering a 75% discount off list price to B Corps. I’d love your thoughts and comments. How has your company implement Corporate Social Responsibility? What other programs have you seen that have been responsible? Do you wish your company were more socially responsible? What impact would that have on your desire to put in full effort at work?